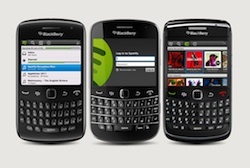 Spotify on Thursday announced the first release of their Blackberry mobile app. The program is the sixth mobile application the company has developed and like their other mobile apps a premium Spotify account is requires to access and stream to your Blackberry Smartphone. Million of songs available instantly on your BlackBerry. The Spotify app has been tested on the following Blackberry devices: 9780 Bold, 9700 Bold, 9300 Curve, 9000 Bold, 8520 Curve. Spotify says the program only works on GSM networks. The program is only available as a preview at at this time however a fully tested version is expected in the App World soon.